As the winter months draw closer, so do the temperatures and weather which affect the operations and reliability of forklifts. Since forklifts form an integral part of the global distribution industry, any forklift downtime due to technical hitches is far from welcome. Therefore, businesses and managers alike should recognise the importance of sufficient protection for forklifts in such weather conditions. Furthermore, they should remember that operators face a unique set of challenges such as ice accumulation, sub-zero temperatures, heavy snowfall, etc. To prepare your forklift to withstand the bitter winter weather, take the following recommended steps. Cooling systems apply to engine powered forklifts. Winters present the risk of the coolant freezing up, so an antifreeze coolant is used to alleviate freezing. In preparation for the winter, clean and flush out your forklift’s cooling system, then add a new antifreeze. The antifreeze works to keep the engine cool in warm weather as well as preventing it from freezing during winter months. For the winter, the right coolant to water ratio is 40:60. It will protect your forklift from all but the very harshest winters. If your forklifts operate in frigid climates, you may consider a 30:70 coolant to water ratio. Visibility while operating any machinery is critical, and forklifts are no different. Winter weather often leaves most areas extremely dark – all the more reason you need to ensure that all lights on your forklifts are working correctly, including the front lights and the tail lights. Poor visibility sometimes may mean a replacement of bulbs. The darker afternoons also have the potential to hide hazard zones on your work site, essentially becoming a catalyst for forklift accidents. On top of investing in adequate forklift lighting, it is essential that you light up your premises. Install floodlights to illuminate your yard. Choose to routinely plough, salt and sand your yard to prevent the snow from accumulating. Oil is a crucial component in a forklift; it serves to lubricate the engine components, prevent rust and also forms the integral fluid for the operation of the hydraulic system used in lifting goods. Freezing winter temperatures have the effect of thickening the oil. The oil can thicken to the point that its consistency is similar to that of honey. This results in impaired lubrication as well as deterioration of the hydraulic system. Replace the oil with the kind that is appropriate for the weather to counter this. You should get oil with a weight ‘W’ for winter and the operating temperature closest to that which you expect to experience. Besides this, check the hydraulic hoses and ensure there are no leaks. The ignition system of your forklift involves the fuel, air and a source of a spark to provide the ignition. The fuel may be diesel or LPG, while the spark comes from the forklift’s battery. Being one of the critical systems in your forklift, without which it can’t move, it is vital that you winterise your ignition system. For a diesel powered forklift, you can either purchase winterised fuel or add antifreeze additives to your fuel system to prevent your fuel from freezing. For LPG driven forklifts, special care should be taken to ensure that your batteries are in top condition. Winter temperatures have the effect of lowering the amps. For this reason, ensure that the battery, as well as the charging system, are checked thoroughly to ascertain that they will function seamlessly during the winter. Similarly, replace the filters and check the condition of the plugs and replace them if their replacement is due. In the dangerous winter weather, it is imperative that your forklift has the right type of winter tires. Ensure that your forklifts’ tires have the right tire pressure and enough tread depth. For outdoor use, you may install studs and chains on the tires to increase grip. 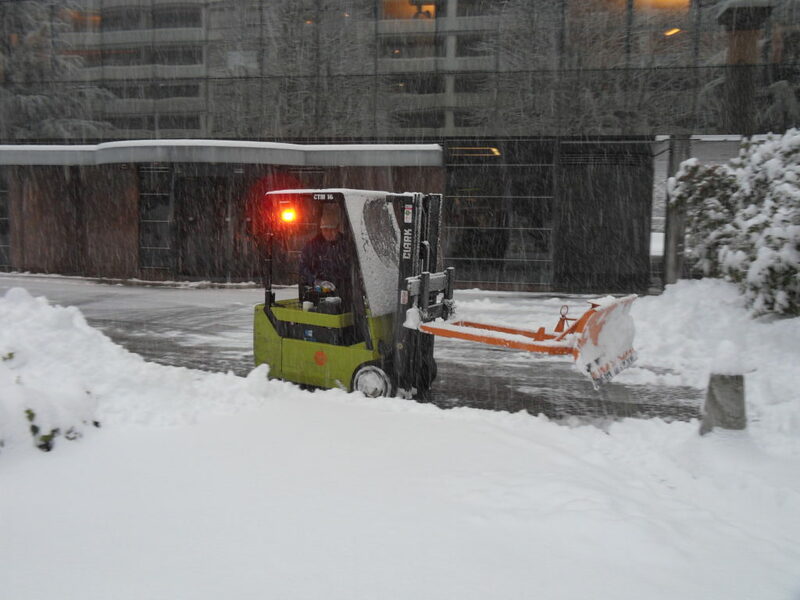 However much you may ready your forklift for the winter, it will all be futile if the operators don’t have the necessary skills to deal with the additional operation challenges that winter brings. Make sure they know what to do before, during and after shifts to ensure the forklifts are in top condition. It is also important that they adjust their driving habits to align with the weather – lower speed, extreme caution and recognising the forklift’s limits. Consider opting for a regular service package to avoid missing an important service. At Fork Truck Direct, we possess lots of expert knowledge on forklift trucks maintenance. Contact us today and we’ll winterise your forklifts in preparation for the bleak weather.